High Meadows is a Carmel neighborhood to the east of Carmel Woods, situated above Carmel-by-the-Sea. 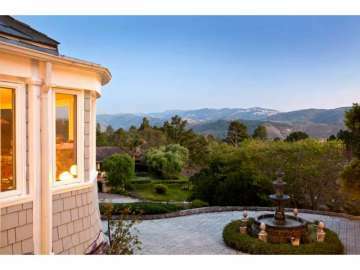 Homes here have spectacular Point Lobos and bay views as well as valley views of the Santa Lucia mountain range. The neighborhood has beautiful estates on large lots as well as lovely townhomes and condos with swimming pool and tennis court amenities. High Meadow Lanes is a 24 unit condominium complex on High Meadow Lane that features fireplaces and 2 car garages. High Meadow Outlook townhomes feature 2 story townhouses with fireplaces, garage parking and forest views. The Vistas features two and three bedroom/ two bath units and is situated on Outlook Drive. High Meadow Terrace is yet another option for condos and features vaulted ceilings, pool and tennis courts. High Meadows neighborhood is bordered by Aguajito Road to the north, Hatton Canyon State Park to the south, Hwy 1 to the west, and La Pradera to the east. Families with children will appreciate being part of the excellent Carmel Unified School District as well as proximity to the private Stevenson School located in nearby Pebble Beach. Click here to preview all Carmel homes for sale in the High Meadows neighborhood. For all available Carmel real estate, click here. 10 homes sold in this neighborhood in 2018. The most expensive home sold for 1.125 million for a 3 bedroom, 3 bathroom home with 2,400 SqFt of living space on a 1,957 SqFt lot with views of the Ocean, Pt. Lobos and the Santa Lucia mountains. The least expensive home sold for 507K for a 1 bedroom, 1 bathroom High Meadow Terrace condominium that needed a little TLC. In 2017, 11 homes sold in this neighborhood. The most expensive sold for 1.889 million for a 3 bedroom, 3 bathroom, 3,380 SqFt of living space on a 43,996 SqFt lot. The least expensive home sold for 623K for a 2 bedroom, 2 bathroom, 1,182 SqFt home on a 1,059 SqFt lot. 17 homes sold in this neighborhood in 2016. The most expensive home to sell was a 4 bedroom, 3 full and 1 half bathroom home with 4500 SqFt of living space on .27 acres with views of Pt. Lobos, Fish Ranch and the Ocean, sold for 2.195 million. The least expensive home sold for 475K and was a 1 bedroom, 1 full and 1 half bathroom condominium with patio. In 2015, 14 homes sold in this neighborhood. The most expensive home sold for 1.895 million and was a 5 bedroom, 5 full and 1 half bathroom, custom-built, Mediterranean estate with 5200 SqFt of living space on 1.38 acres. The least expensive home sold for 390K and was a 1 bedroom, 1 full and 1 half bathroom condominium with a patio. 16 homes sold in this neighborhood in 2014. The most expensive home sold in High Meadows sold for 2.9 million and was a 4,381 SqFt home on one acre with dramatic views, while the least expensive was sold for $432,500 and was a 1,197 SqFt, 2 bedroom, 1 full and 1 half bathroom, end-unit condominium. 13 homes sold in this neighborhood in 2012. The most expensive home sold for 1.525 million and had 3 bedrooms and 4 baths within 3,820 SqFt of living space on a 1.2 acre lot. The lease expensive home sold in the neighborhood came in at $388,500 and was a 2 bedroom, 1.5 bath condo with 1,197 SqFt of living space and a balcony overlooking the tennis courts and forest. Living in High Meadows you will enjoy your wonderful proximity to the best of the Monterey Peninsula. Carmel-by-the-Sea with its storybook charm is a short 5 minute drive away, where you can take advantage of fine dining, unique shopping and great beach activities. Your convenient address will allow you to take a first seat at Pebble Beach events like the AT&T Pro Am and the Concours d’Elegance, or enjoy a game of golf on one of its 7 renowned golf courses. You will also enjoy venturing into Monterey for business or pleasure and visiting the historic Cannery Row and Monterey Aquarium. Your peaceful location and stunning views will make entertaining at your home a dream as you relax on the terrace with friends and family and soak in the sparkling views.